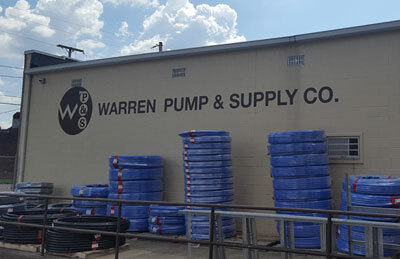 Welcome to Warren Pump and Supply Co.
"Warren Pump & Supply Co. was founded in 1964. We are a family owned and operated business." We are one of the areas leading wholesale distributors of water pumps, tanks, pipe, casing and other related water well products and accessories. The business expanded in 1976 to become a manufacturer of our own line of water treatment in our Warren Ohio location. We take pride in supplying premium products for the professional water well market, water well drillers, pump installers and water treatment specialists. We pride ourselves through the entire sale process; taking the order, delivery and applying their payments correctly. With our expertise & experienced sales staff, you can't go wrong. Click here for more info on our Locations! For Dealer Discount Pages, contact your sales representative. If you already have your login, click the Catalog menu option in the menu bar above to view our catalog. "We have been working with Warren Pump for over 30 years and we can always count on them for timely deliveries and excellent customer service." "Warren Pump’s knowledgeable staff makes my ordering needs a breeze." "I can always count on Warren Pump when we need something in a hurry for a rush job."